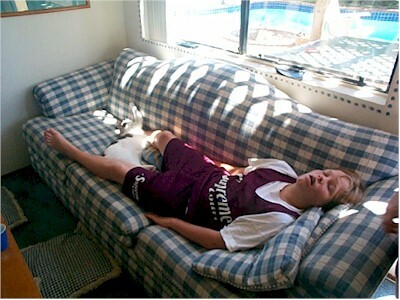 Oftentimes, Scott sleeps in on a Saturday morning, not because he's lazy, but because he has basketball practice at 8:00 am and returns to the house exhausted. Snickers loves it when we stretch out on the couch. Perhaps he likes sharing activities with us, or maybe it just provides a little variety, having something else on the couch to lean against. Today, Scott is sleeping on the other couch, not because of basketball practice (which was cancelled today, for some reason), but because he spent the night at a friend's house. That's a sure bet for lack of sleep. Another reason that might explain his late morning slumber is that he's watching the DVD we saw without him last night: Gosford Park, an interesting, but not terribly exciting mystery movie about interactions among privileged class and their servants.